From what groups did Pancho Villa and Emiliano Zapata draw their primary support? Why were these groups dissatisfied with the established regime? Several of the larger Latin American states have experienced upheavals that have brought a change in government. What is the justification for saying that only Mexico had a genuine revolution? What were the objectives of the Mexican Constitution of 1917? In what ways were attempts made to realize those objectives? To what extent were those attempts successful? Describe the reform program of President Lázaro Cárdenas. What problems accompanied the industrial expansion beginning in the 1940s in Mexico? Describe the consequences of the Mexican government's miscalculations following the discovery of oil and gas in 1976. Identify the root causes of social and political unrest in Mexico. What were the major achievements of Carlos Salinas as president of Mexico? To what extent are Brazil's problems typical of industrializing societies? To what extent are they typical of many Latin American societies? What were the major features of Brazil's economic boom beginning in the 1960s? What were the frailties of this period of growth? What led to Brazil's hyperinflation of the 1980s? What were its political consequences? What natural advantages does Argentina possess? What factors have led to instability, inequality, and conflict in Argentina in the twentieth century? What were the bases of Juan Per¢n's political support? What was the character of his rule, and what were its consequences? What circumstances brought about the fall in 1983 of the military junta that had ruled Argentina for seven years? How do you explain Argentina's decline from prosperity to near bankruptcy within the span of a century? What measures did President Carlos Saúl Menem take to bring Argentina's inflation under control and improve Argentina's economy? How successful were his policies? What were the major changes pursued by Salvador Allende as president of Chile? How do you account for the violent overthrow of Chile's democratically elected president in September 1973? Why, in your judgment, was General Pinochet able to retain power longer than several other contemporary dictators? How do you explain the trend toward military dictatorships in much of Latin America after the Second World War? In what respects was Peru's military dictatorship of the 1970s different from other military regimes? What factors have promoted the expansion of coca cultivation in northeastern Peru? What hazards (both domestic and international) does it pose? What did Alberto Fujimori do to try to turn the Peruvian economy around? What signs of success can you point to? How do you explain Uruguay's turn from a relatively high level of democracy to dictatorship and repression by the 1970s? "Bolivia could be viewed as a working model of the problems and frustrations confronting Latin American nations." Explain this statement. What are some of the general weaknesses common to many Latin American economies? What were the objectives of the "Twenty-sixth of July Movement" in Cuba? Despite successes in some areas, what have been the roadblocks to the achievement of all of Fidel Castro's dream for Cuba? 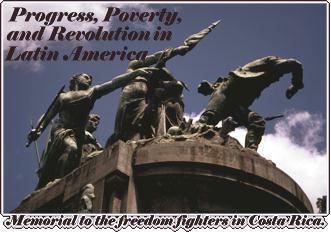 What circumstances delayed the coming of revolution in Central America? In 1979 dictators were expelled both from Nicaragua and El Salvador. How has the subsequent regime in El Salvador differed from Nicaragua's? Compare or contrast the objectives of the Sandinistas with those of (a) the Mexican revolution, (b) the Cuban revolution. Explain why the United States' position with regard to Panama changed from cooperation with the government of General Omar Torrijos to conflict with the government of General Manuel Noriega. What are some of the indicators that could give hope for greater stability and prosperity in Latin America in the future? a. Argentina during the Perón decade. b. Economic and educational progress in Mexico. c. Relations between the United States and Latin America in recent decades. d. The role of foreign investments in the economies of Latin America. e. Conflicting interpretations of the Cuban revolution. f. The 1965 crisis in the Dominican Republic. g. Latin American contributions to literature, art, or music. h. The career of Salvador Allende. I. The Organization of American States. j. The Falkland Islands war. k. The controversy over negotiation of the Panama Canal treaties of 1977.
l. The application or nonapplication of the Monroe Doctrine since its formulation in 1823.
m. Reasons for, and outcomes of, U.S. intervention in Latin America in the 20th century. Explore the competing interests in Latin America's rain forest. Based on your reading and your personal priorities, propose a solution to the problem.